Fiscal policy is really about taxes and spending and the federal government recently provided some hints on its plans in these areas. In the recent Speech from the Throne, the government reaffirmed its commitment to balancing the budget by 2015-16 and providing greater tax relief for Canadian families after the budget is balanced. But what form this tax relief may take remains a mystery. 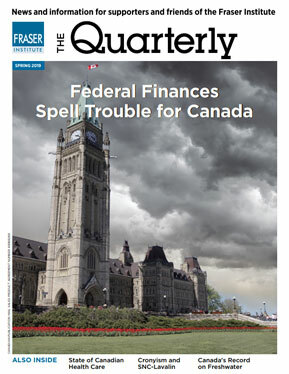 Over the course of the past several months, outgoing Bank of Canada Governor Mark Carney and Federal Finance Minister Jim Flaherty have repeatedly warned that Canadians are spending beyond their means and taking on too much debt. The May 2 minority Liberal budget is a politically expedient document that likely avoids an election but unfortunately fails to tackle Ontario's looming fiscal crisis. The longer the province waits, the more difficult and painful the reforms will be when the inevitable day of reckoning arrives. Last weeks provincial budget was a heap of bad news for New Brunswickers. First they learned that they will continue to be burdened by a government with shaky finances driven by annual deficits and mushrooming debt. Topping that off, Progressive Conservative Finance Minister Blaine Higgs proposed a series of highly damaging tax increases as a way out of New Brunswicks deep fiscal hole. Unfortunately, these tax hikes will cast a dark cloud over New Brunswicks economic prospects and likely bring little revenue in return. The key litmus test for the Harper governments 2013 budget was always going to be how realistic it was with respect to achieving a balanced budget by 2015-16. The governing Tories have staked both their economic and political credibility on being able to balance the budget. The current plan, which mirrors previous budgets, relies on controlling the growth in spending and hoping revenues increase sufficiently to balance the budget. BC's $1.5 billion question: How will de Jong eliminate the deficit? Going by Finance Minister Mike de Jongs public comments, Tuesdays provincial budget is supposed to present a plan to finally balance the books. But after four consecutive years in the red, British Columbians cant yet breathe a collective sigh of relief. Critically important is how Minister de Jong plans to eliminate the deficit. Will he take the path of tax increases or spending reductions? All politics is local, said Tip ONeill, the 1980s-era leader in the U.S. House of Representatives. That may be true, but government budgetsespecially in Albertaare increasingly anything but local. International events and economic developments regularly affect economies and government finances on the other side of the planet. One century ago, few would have wondered how a sovereign debt default by a Greek government might affect British, American and Canadian economies. Canada's Conservative government deserves praise on a number of fronts. Since coming to power, the Tories have ended the reflexively relativist approach to foreign policy, tackled supposedly politically sensitive immigration issues and understood and promoted the need for private-sector jobs, especially in the energy sector. Thus, when David From wrote, in his Saturday National Post column, that under Stephen Harper, Canada can fairly claim to be the best-governed country among advanced democracies in the world, he was not far off the mark. Ever since the last recession, Canadians have been informed by pundits and the political class that stimulus spendingperhaps better labelled as binge spendingwas critical to Canadas economic recovery. But extra government spending had little to do with Canadas exit out of the recession. The recession ended in mid-2009; it was only about then that federal and provincial governments started spending extra (borrowed) stimulus cash.